Tweet! I`m a young man named Porter. My foster mom gave me that name-its a good strong one don`t you think? I was found as a stray and ended up in a shelter. 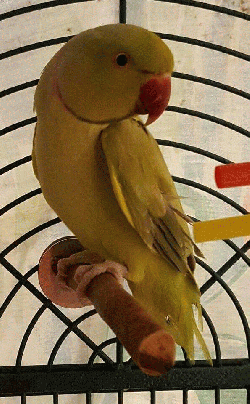 I`m an inquisitive little guy and mickaboo thinks I may have lived with other birds at one time. Although I`m in my own cage I try my hardest to get as close as I can to the bird in the cage next door.I`m getting more comfortable around my foster mom and I love my spritz baths that she gives me. I`m still pretty shy, but do like human attention as long as the person moves slowly. Some believe I was traumatized at one point and Im having to learn to trust again. I eat pretty well including pellets, grapes, oranges &sunflowers. I`ve not been around kids yet and I don`t liked to be touched...yet. I`m a sweet little guy though and I`m learning to overcome my fears. Perhaps you`d like to adopt me and teach me that everything is ok? Contact my coordinator if you think we might hit it off. A home with another small bird would be fabulous. Toes crossed that I hear from you soon!